I searched long and hard for a new desk lamp. 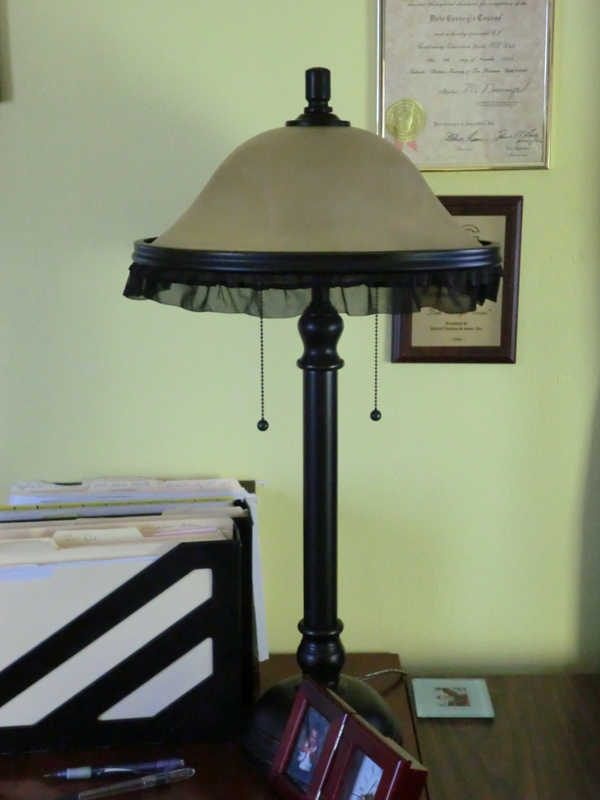 My old one was a table lamp given to us when my husband’s grandmother died. I could not use the compact fluorescent bulbs in them and it would occasionally flicker. One night it set up off the breaker and I knew it had to go. I chose this lamp because it looks like it fits in a library and it takes two 60 watt compact fluorescent bulbs. That gives me the option of 60 watts or 120 watts depending on what I need. But when the lamp arrived, I found that it was about an inch too tall and the bulb would shine right in my eyes. I debated about sending it back, but I loved it. I decided to add some tulle trim; I had in with my sewing materials, around the base of the glass shade. I loved the trim and had not found a place to use it. The tulle diffused the bulb glare without cutting down on the light that was directed below. I now have a lamp that I love…with a touch of my personality! This entry was posted in Decorating, Energy Efficiency, Furniture, Make It, Use What You Have and tagged Decorating, Energy Efficiency, Furniture, Make It, shopping, style, Use What You Have by Frugal Fish. Bookmark the permalink.